"It is always such an amazing night where we get to hear all the amazing and inspiring stories of high school students who persevere through crazy trials and achieve their dreams. They also get to be awarded with lots of free money!!" Congratulations go out to Tiffany Guyot, Viet Pham, and Nadyah Shah! 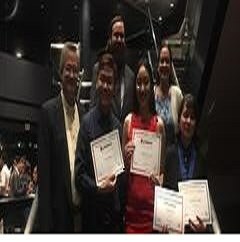 just wanted to let you know that the AVID Team (Me, Lou Podesta, Adam Waugh, Loan Wu, and Louise Milner) went to the OCDE AVID Senior Scholarship Recognition Ceremony last night at UCI. It is always such an amazing night where we get to hear all the amazing and inspiring stories of high school students who persevere through crazy trials and achieve their dreams. They also get to be awarded with lots of free money!! I am so excited to tell you that our three students who were invited this year recieved $62,000 total.